They already track innocent citizens' movements with CCTV, are in cahoots with police over speed cameras, and have been using powers supposed to tackle terrorism to put tails on people suspected of minor 'crimes'. Now local authorities are putting spy planes in the air to snoop on homeowners who are wasting too much energy. The data is being used to create colour-coded maps which will enable council officers to identify offenders and pay them a visit to educate them about the harm to the environment and measures they can take. A scheme is already underway in Broadland District Council in Norfolk, which has spent £30,000 hiring a plane with a thermal imaging camera. It said the exercise has been so successful other local authorities are planning to follow suit. But critics have warned the crackdown was another example of local authorities extending their charter to poke their noses into every aspect of people's lives. Broadland, which covers towns including Aylsham, Reepham and Acle, hired the plane from a Leicestershire-based company for five days at the end of January. The aircraft took images of homes and businesses, with those losing the most heat showing up as red, while better insulated properties appear blue. The council's head of environmental services, Andy Jarvis, said the original plan was to target businesses but it was realised the scope could be extended to include residental properties. 'The project we put together was for a plane to go up on various nights flying strips of the district and taking pictures,' he said. 'Through those images, a thermal image photograph can be created in which you can pick out individual properties which are losing a lot of heat. 'We do a lot on domestic energy conservation already and realised it would be useful to see if any of the homes which were particularly hot were properties where people had not insulated their lofts. More than half the UK's carbon dioxide emissions come from the domestic sector, which includes property and transport. Almost 60 per cent of a household's heat is lost through uninsulated walls, lofts and windows, costing the average home £380 a year. Insultation is estimated to reduce each home's carbon emissions by around two tonnes annually. The first city in the UK to make a heat-loss map was Aberdeen, while the first local authority in England was Haringey Council, in London - although environmental groups at that time said they viewed the practice as a 'gimmick' of little real value. The TaxPayers' Alliance has added concerns about the issue of privacy. He added: 'We're in a recession and you would have thought this council had better ways to spend £30,000. 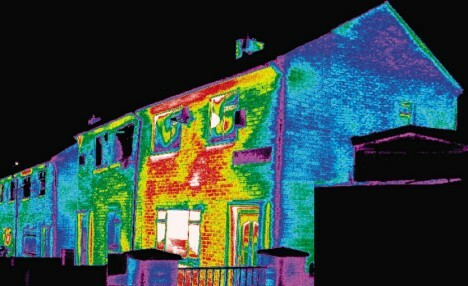 But Conservative-led Broadlands insisted the heat-loss map would allow officers to pinpoint offenders and point out how to get help and grants to improve insulation to cut carbon emissions. Council leader Simon Woodbridge said the project would 'effectively pay for itself within a few weeks in terms of the amounts of money we can help people to save'. Britain now has more than four million CCTV cameras - a fifth of those in use around the world - and around 8,000 speed cameras. Almost 500 local authorities have been using anti-terrorism powers brought in under the controversial Regulation of Investigatory Powers Act to launch a string of bizarre investigations. These have included checks on dog fouling, putting bins out on the wrong day and people trying to cheat school catchment area rules.